Senior Nathan Childs won the $500 grand prize in the DCU Innovation Contest on April 25, presenting two financial literacy programs created by the WSU Enactus Team to help the men of the Hector Reyes House, a residential program for Hispanic men recovering from substance use disorders. Childs beat three other teams of WSU students from Adjunct Professor of Urban Studies Amy Mosher Berry’s Introduction to Entrepreneurship class, which has been taught downtown at the Worcester Idea Lab for the last two spring semesters. Childs, a business administration major, said he will be donating the $500 prize to the Worcester State Foundation to support Enactus, an entrepreneurial student club that works with the community to help make the world a better place. This is the second year that WSU has participated in the contest, which encourages students to think of big ideas that could make a difference in the banking and financial services industry. David Araujo, senior vice president for technology and innovation at DCU, works closely with Berry and the students throughout the semester to prepare for the contest. Participants are given a number of potential areas to consider, including digital and mobile payments, cloud computing, financial literacy education, and small business solutions. The four finalists presented for five minutes before a panel of judges from DCU: Craig Roy, senior vice president for lending; Dave DeWitt, senior vice president for enterprise services; and Julie Moran, senior vice president for member services. Childs presented two programs that were created and continue to be run by Enactus members. The first program teaches the men of the Hector Reyes House about financial literacy and is a required component of the recovery process. The second program, called “Back on the Books,” helps the men to become current on their tax returns. The program provides access to no-cost tax preparation through the WSU VITA program, and then encourages them to open bank accounts to cash their refund checks, as opposed to using a check-cashing service. Poetry absorbs and reflects so much of the human experience—so much about culture, history, memory, love, the body, art, and God, says Peter Balakian, a Pulitzer Prize winning poet. Then why is it so often regarded as a pleasant but superfluous literary exercise? 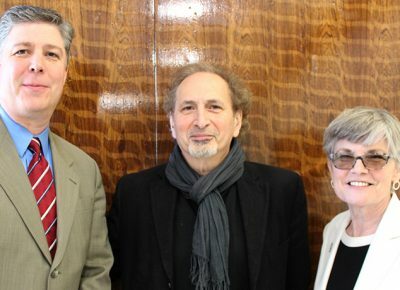 The poem “can and should have a much bigger place in civic life,” he said in a talk at Worcester State University April 26. . . .